He slammed big companies and free trade in the primaries, but Barack Obama insists he just wants to show corporate America some tough love. We go behind the scenes to see how he plans to make the U.S. a land of opportunity once again. Obama backstage on the first stop, in Raleigh, N.C., of his two-week campaign in June to roll out his ideas for fixing the economy. Says he: "We're going to have to make some basic investments" in everything from energy to health care. (Fortune Magazine) -- Barack Obama is shaking his head. "No, no, no, no, no." His slim figure had been bent forward in a folding chair (prime position to radiate outsized charm). But my question - does he consider corporate America a destructive force? - prompts him to bolt upright to a more defensive pose. It's a purposely provocative query, but a fair one: When Obama talks about business, it's usually to complain about corporate tax breaks or trade deals or jobs shipped overseas. High-paid CEOs are the familiar villains in his stump speeches, including the one he has just given on this Raleigh fairground. Free-market critics look at his varied plans to raise taxes and pronounce him hostile to wealth creation and market growth. And in a small but telling episode during the Indiana primary, his campaign used a 2007 Fortune cover story - "Business Loves Hillary" - to attack Clinton, as if "business" were a dirty word, not the nation's economic engine. So? "There's a reason why the business community in Chicago as a whole has been very supportive of me," he says. "They know I am a pro-growth guy, and I'm a pro-market guy. And I always have been. What I do get frustrated with is an economy that is out of balance, that rewards a very few - with rewards that are all out of proportion to their actual success - while ordinary, hardworking Americans continue to get squeezed. Over the last decade or so, this economy grew substantially, and more than half of the total growth was captured by the top 1%." Here, the great reconciler pauses, just briefly, to give due to forces that aren't easy targets of political blame. "Now part of that has to do with globalization and with global capital being able to move everywhere it wants. It has meant a winner-take-all environment." But, he adds, quickly returning to Washington politics, "a lot of it has to do with tax policies" that favor the big winners. 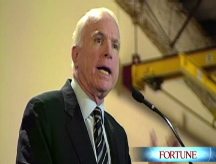 That means President Bush's policies, and by extension those of Obama's rival, John McCain. We are sitting in a bare, cinderblock room next to the hall where he has just kicked off a two-week tour to promote his economic plan. "I love the heat - I just don't like wearing suits in the heat," he explains as we take refuge from a 100-plus-degree North Carolina afternoon, and he politely asks permission to take off his suit jacket and drape it on the back of his chair. I think back to the first Obama campaign rally I covered, picking through treacherous ice patches in the parking lot of an Iowa high school gym, where earnest troops of volunteers operated under the motto Respect, Empower, Include, as if they were prepping for a Boy Scout jamboree. The first-term Senator from Illinois - unheard of on the national scene until his "audacity of hope" speech at the 2004 Democratic convention - was an improbable nominee. Yet five months later, this political upstart had dashed a former First Lady's carefully laid plans, and with Kennedy-like cool, laid claim to the Democratic nomination. Now November suddenly looms, and Obama must court an audience far larger than the nearly 18 million voters who checked his name in the Democratic primaries - most of whom told pollsters they were either "liberal" or "very liberal." He must win over not only skeptical independents but also a like number of Democratic Clinton voters - many of them in key swing states and some of whom worry that Obama is too far to the left or too inexperienced to govern. Toward the business community, he will build on a message of "tough love" that he has delivered since he landed in Detroit a year ago to tell the auto industry he would impose strict emissions standards, but in return help them with crippling health-care costs. In the coming months voters will hear that a decade-long middle-class squeeze hurts business, because it "reduces demand for the stuff that companies are selling," says his economic advisor, Austan Goolsbee. Therefore, he argues, business should support Obama's plan to shift the tax burden toward the wealthy and raise the federal minimum wage to $9.50 over two years (under current law it goes to $6.55 in July). As Obama says on the campaign trail, "In America, prosperity has always risen from the bottom up." Likewise, he argues, increased regulatory oversight, capital requirements, and transparency standards will help capital markets by injecting stability. More federal spending on education and basic science will improve workforce quality. 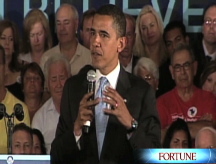 "I still believe that the business of America is business," Obama told Fortune. "But what I also think is that with all that power and talent, and all those resources at their disposal, comes some responsibilities - to not game the system, to not oppose increased transparency in the marketplace, to not oppose fiscally prudent measures to balance our budget." Obama insists that he's a pragmatist, not an ideologue. "We're not an ideological people," he says. "We're a commonsense people who say, 'What's going to work?' and 'Let's figure it out.'" His voting record, however, is among the most liberal in the Senate, reflecting the sensibility of a former community organizer who for 20 years belonged to a church that urged congregants to disavow the pursuit of middle-classness. During the primary campaign, his rhetoric was sharply populist, denouncing big business and blaming the shift of jobs overseas on free-trade agreements. "He's the least influenced by corporations and CEOs" of any candidate, proclaimed Anna Burger, president of the union coalition Change to Win. Obama was so tightly aligned with labor leaders, embracing a legislative measure to promote union organizing, that it's still hard to find any points of disagreement. Yet there are hints that the presumed Democratic nominee's economic agenda remains a work in progress - and will evolve toward his ambition to win in November. Already his circle of advisors has expanded beyond a small core of academics to include veteran capitalists inside the Democratic Party. In late March he gave a thoughtful if sometimes vague speech on the need for more financial-markets supervision, which was heavily influenced by advice from former Fed chairman Paul Volcker. He is frequently on the phone with billionaire CEO Warren Buffett ("one of my favorite people," says Obama, "he's just completely down-to-earth and as smart as they come"), a critic of the financial industry and of tax breaks for the rich who also happens to understand capital markets better than just about anyone. Obama calls on Apple's Steve Jobs to help him "think about how to be successful and nimble in the current global environment." Advice also comes from Wall Street veterans like J.P. Morgan Chase CEO Jamie Dimon and Centerbridge Partners founder Mark Gallogly - as well as longtime Chicago friends Penny Pritzker of Hyatt (who runs his campaign finances), Ariel Capital's John Rogers, and investor James S. Crown. In his first management act as de facto Democratic nominee, Obama signaled that he might inch toward the center. He enraged labor leaders and liberal activists by appointing Jason Furman to run his economic team. Furman directed the Hamilton Project, a Brookings Institution--based initiative sponsored by former Clinton Treasury Secretary Robert Rubin, a centrist and pariah among hard-core liberals. Furman has defended free-trade agreements, and at a time when unions were on the warpath against Wal-Mart (WMT, Fortune 500), he produced a research paper arguing that the chain's low prices are a boon to low-income consumers. On the same day that Furman's appointment was announced, Obama told CNBC he might consider deferring some of his tax increases if the economy remains in bad shape. According to Furman, Obama will consider cutting the corporate tax rate while revising the tax code to eliminate business incentives to accumulate more debt and to discourage moves offshore. And in Obama's interview with Fortune, the candidate suggested that his overheated rhetoric on NAFTA was just that - overheated rhetoric. Asked what single economic concern worries him most and will be uppermost on his mind if he steps into the Oval Office next January, Obama said energy supplies. "It's not a problem I think we can drill our way out of," he says. "It can be a drag on our economy for a very long time unless we take steps to innovate and invest in the research and development that's needed to find alternative fuels, to make our transportation system more energy efficient, retool our industry and our buildings." But to encourage a transition toward alternatives, Obama favors legislation that would make fossil fuel more expensive. Doesn't that mean more pain to come under an Obama presidency? "There is no doubt that in the short term, adapting to this new energy economy is going to carry some costs." But, he adds, citing the coal industry's ability to adapt to stop acid rain in the 1980s, "I would never underestimate the power of American innovation." During this year's long, hard-fought primary campaign, Obama had about the same effect on his audiences as Bruce Springsteen did on his breakout Born to Run tour. This time they had seen the future of the Democratic Party, and its name was Barack Obama. In Iowa they braved below-zero wind gusts; in balmy Oregon they had to contend with each other: a throng of 70,000 human beings gathered on the Portland waterfront. By contrast, this June kickoff to the general election campaign is oddly subdued - as if the excitement over the freshness of his candidacy, his message of unity and optimism, hasn't carried over to the mostly traditional Democratic policy prescriptions he offers in the small print of his campaign. Here in Raleigh, there are empty seats sprinkled about rather than hourlong lines to get in. His audience is respectful but lacks the mass energy that transformed this 46-year-old Harvard Law graduate into a national phenomenon. And anyone hoping for an innovative response to the previous week's outpouring of bad economic news will be disappointed. At the climax of his speech, Obama offers ... another $50 billion federal stimulus plan. Bill Clinton jumped to the front of the pack in 1992 with a commitment to break with liberal orthodoxy, promising to balance the budget and "end welfare as we know it." Obama has praised Ronald Reagan for bringing optimism, dynamism, and a sense of entrepreneurship that changed the "trajectory of America." Likewise, Obama burst on the scene as an inspiring and inclusive leader, one offering a "politics of practicality vs. ideology." A standard applause line was, "It's easy to be against something. It's harder to be for something." Money poured in, and he used it to build a nimble, efficient, and admirably honorable campaign operation. and (b) shifting the tax burden upward: ending the Bush tax cuts on families making more than $250,000 and raising payroll taxes on those same higher-income earners (the latter meant to bolster Social Security without cutting benefits or raising the retirement age). Middle-class earners would receive tax cuts, and low-income seniors would pay no income tax. Combined with a tax rebate as part of this new $50 billion stimulus plan, he argues, putting more money in the hands of middle-class consumers will help them cope with the income squeeze as well as rising energy prices. Obama also wants to raise a range of other taxes on business and investment. He would increase the 15% capital gains tax rate - probably to 25%, according to advisors, though he excludes small businesses and new ventures from the tax altogether. He would raise the dividends tax, reinstate a 45% tax on estates worth more than $3.5 million, and close $1.3 trillion in "corporate tax loopholes." The thinking behind those tax hikes comes in part from Goolsbee, a University of Chicago economist who has studied behavioral response to economic policies. Goolsbee believes the Republican argument that lower tax rates - by spurring investment and productivity - end up generating more revenue than they lose is overblown. (He notes that Obama wants to go back to the rates of the '90s, when the economy was booming.) Instead, he believes the tax code should be used to ease financial pressures on the middle class. In mid-February, as the Democratic primary contest between Obama and Clinton moved toward the Rustbelt, the populist rhetoric of both candidates sharpened. Both candidates blamed free trade for factory closings. And in a move that unnerved leaders around the globe and prompted top House Democrats to distance themselves, both Obama and Clinton vowed to opt out of America's most important standing free-trade agreement, NAFTA. The pact linking Mexico, Canada, and the U.S. into a North American free-trade zone was Bill Clinton's signature accomplishment, but NAFTA is also the bugaboo of unions, liberal activists, and plenty of angry Midwesterners looking for a root cause of factory closings. Obama jumped right into the antitrade waters with Clinton, calling NAFTA "devastating" and "a big mistake" - even though a 2005 Congressional Research Service study showed the pact had a mild positive effect on the U.S. and Mexican economies. Obama's own advisor, Goolsbee, had argued that America's wage gap was the result of a globalized information economy - not free trade. There were signs back then that Obama's view was more conflicted. On Feb. 8, Goolsbee met with the Canadian consul general in Chicago and offered assurances that Obama's rhetoric was "more reflective of political maneuvering than policy," according to a Canadian memo summarizing the meeting and obtained by Fortune. "In fact, he mentioned that going forward the Obama camp was going to be careful to send the appropriate message without coming off as too protectionist." With the primary contest over, I asked Obama to clarify his remarks on NAFTA. "I think that sometimes during campaigns the rhetoric gets overheated and amplified," he concedes. Did his? "Politicians are always guilty of that, and I don't exempt myself." During a debate before the Texas and Ohio primaries, Obama said, "We should use the hammer of a potential opt-out" to force Canada and Mexico to renegotiate NAFTA. Now, however, he says he doesn't plan to unilaterally reopen NAFTA, that he had just spoken with Canadian Prime Minister Stephen Harper that morning (Harper had called to congratulate him on the nomination), and that "I'm looking forward to a conversation with him. I'm a big believer in opening up a dialogue and figuring out how we can make this work for all people." Obama also argues that "there are costs to free trade": He notes that under NAFTA, a more efficient and modernized U.S. agricultural industry displaced Mexican farmers, producing more immigrants. We "can't pretend that those costs aren't real. My job as President is to take those into account." Otherwise, he says, it feeds "the protectionist sentiment and the anti-immigration sentiment that is out there in both parties." The Author of "Dreams From My Father" and "The Audacity of Hope" is, at root, a storyteller. So he has a narrative on the troubled U.S. economy behind his stump-speech observation: "We did not arrive at the doorstep of our current economic crisis by some accident of history. This was not an inevitable part of the business cycle that was beyond our power to avoid." Today's mortgage-market troubles, according to the Obama camp, are the inevitable result of a middle-class squeeze that President Bush never addressed. "It left people with no margin for error," notes Goolsbee. "The savings rate goes to zero. People start taking money out of their houses. And a powder keg gets lit when a downturn comes." The next potential implosion, he says, is credit card debt, and Obama has proposed a consumer bill of rights that restricts card companies' ability to raise rates and creates a federal credit-card rating system. While Obama insists that "we don't need more heat, we need more light" in Washington, his plans to increase spending and taxes - to "make the most fortunate pay more of their fair share," as he puts it - is certain to generate plenty of heated opposition from business and taxpayer advocates. Already, though, Team Obama is on the prowl for areas of consensus, pointing to growing calls by business leaders for health-care reform, for energy independence, for a more skilled workforce, for investments in the country's physical infrastructure - roads and bridges and communications networks. Obama argues that American business needs government help to stay competitive in the global economy. He has made believers out of Chicago's business leaders - now he has four months to persuade the rest of America that it's not just spending he wants, it's investment in the future.